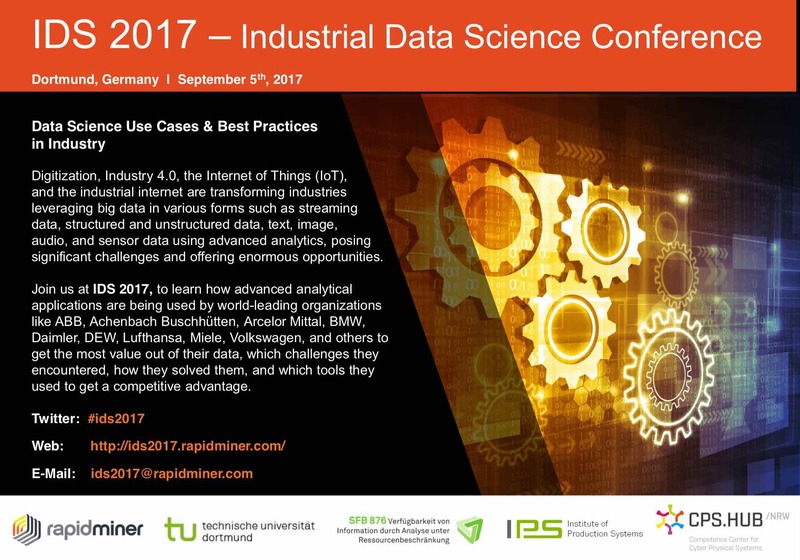 From Industrial Engineering towards Industrial Data Science Speaker: Prof. Dr.-Ing. 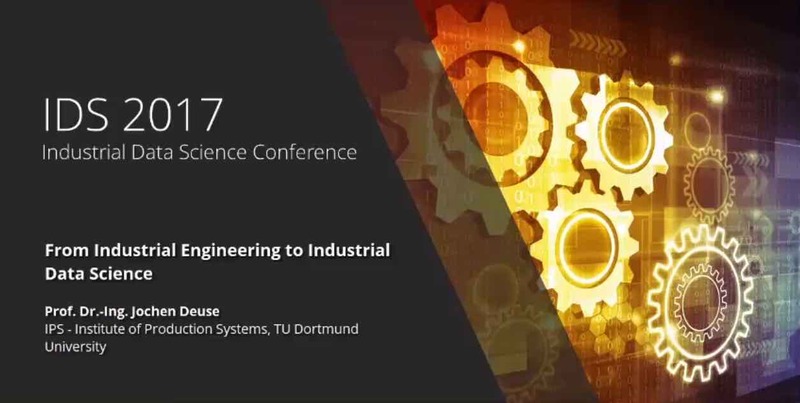 Jochen Deuse, Head of the Institute of Production Systems (IPS), TU Dortmund University The challenges and requirements an industrial engineer has to face in his daily busi- ness have significantly changed in the context of Industry 4.0. While the core tasks of the Industrial Engineer are rooted domain specifically in work and motion studies and work system design, his methodological spectrum is increasingly changing from using basic descriptive statistics towards digital manufacturing, factory physics, and machine learning. 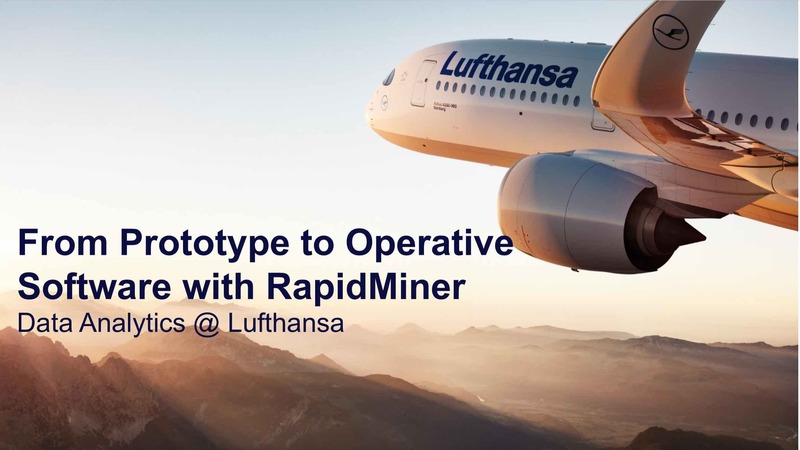 From Prototype to Operative Software – Data Analytics @ Lufthansa Speaker: Dr. Fabian Werner, Lufthansa Industry Solutions How do data scientists and engineers best bring their expertise into a productive state? – Lufthansa Industry solutions uses a standard approach to operationalize data analytics at organizations. We will give a general overview over analytics use cases at Lufthansa and show some practical use cases from the airline industry such as the prediction of arrival times of aircrafts or whether passengers show up in or- der to take their flight. 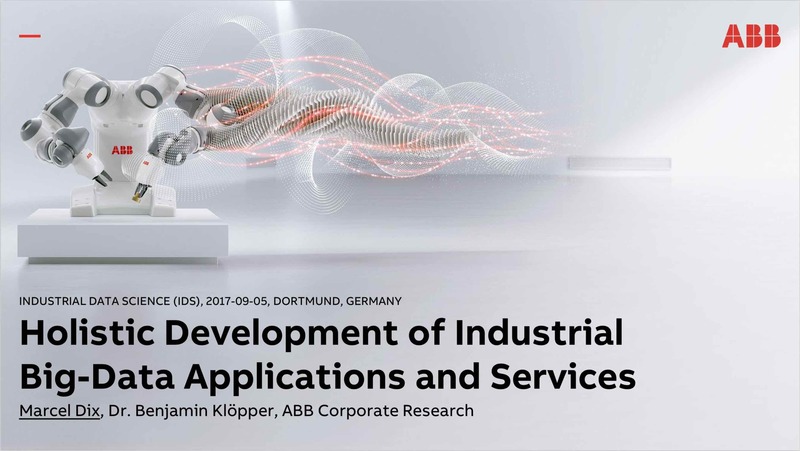 Holistic Development of Industrial Big-Data Applications and Services Speakers: Marcel Dix and Dr. Benjamin Klöpper, ABB Download the talk: here The application of big data and data analytics for optimizing production and mainte- nance processes is one of the most important use cases for industrial IoT. The talk introduces ABB’s development process for data driven services. The development process is essentially organized in four steps: 1. Development of value propositions and deduction of relevant analytical questions 2. 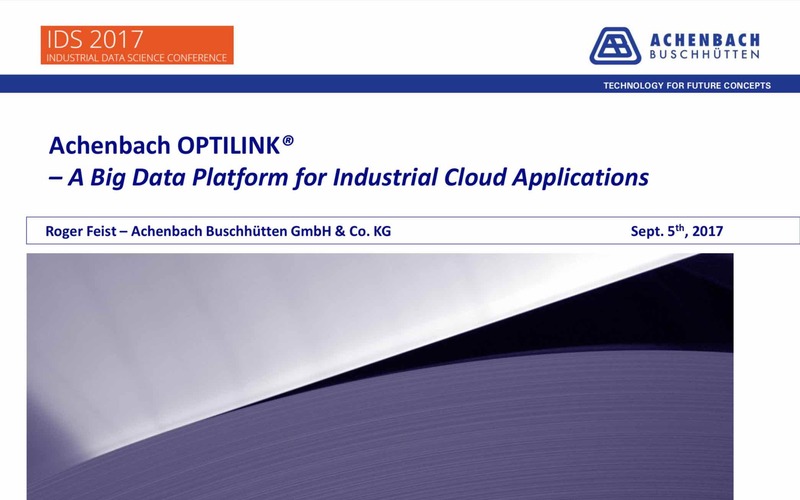 Optilink – A Big Data Platform for Industrial Cloud Applications Speaker: Roger Feist, Achenbach Buschhütten When algorithms and solutions have been verified in laboratory environments, it’s time to pave the way for their real field application. Here Optilink® becomes a product with interesting perspectives. Starting with a bottom-up approach, Optilink® is a tool chain to acquire, transmit, and analyze huge amounts of real-time- and historical-data of machinery in a safe and scalable cloud environment. Dynamic Bottleneck Forecasting in Flexible Manufacturing Systems Speaker: Ferdinand Klenner, BMW In the context of Industry 4.0, flexible manufacturing systems are the conceptual basis for highly flexible and efficient high-volume manufacturing. But the inherent complexity of these systems and the lack of transparency impede the further increase of their efficiency. If the number of machine breakdowns exceeds the resources of operators and maintenance, it is necessary to guide the employees to the most critical machines. 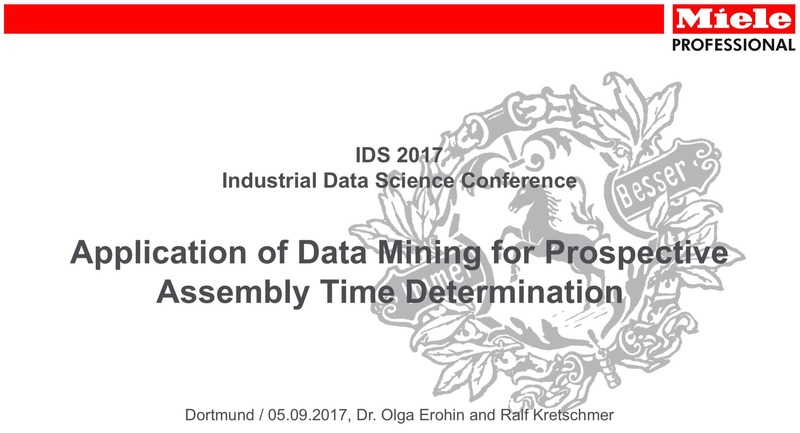 Application of Data Mining for Prospective Assembly Time Determination Speaker: Dr. Olga Erohin & Ralf Kretschmer, Miele When algorithms and solutions have been verified in laboratory environments, it’s time to pave the way for their real field application. Here Optilink® becomes a product with interesting perspectives. Starting with a bottom-up approach, Optilink® is a tool chain to acquire, transmit, and analyze huge amounts of real-time- and historical-data of machinery in a safe and scalable cloud environment. 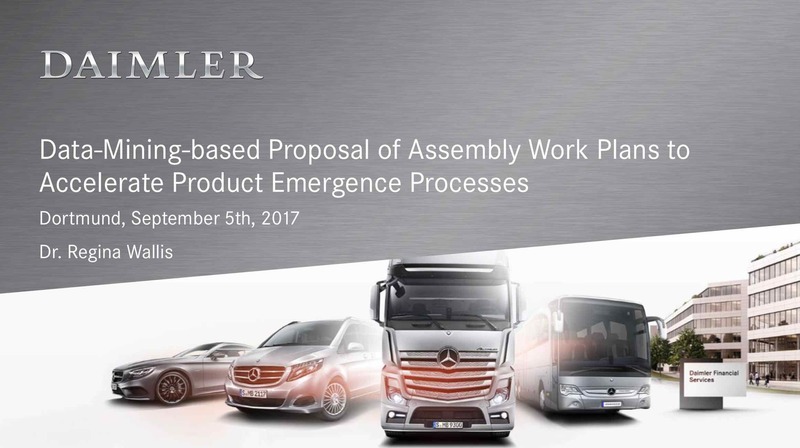 Data-Mining-Based Generation of Assembly Work Plans to Accelerate Product Emergence Processes Speaker: Dr. Regina Wallis, Daimler The application of digital assembly planning tools leads to a large amount of data documenting product development and assembly planning results along the product emergence process. The reuse and adaptation of existing planning data can accelerate future planning processes. The presented approach uses data mining techniques to generate a suitable assembly work plan from existing planning data as a starting point for a new assembly planning task. Prediction Model for Agile Rework Scheduling Speaker: Sven Krzoska, Volkswagen (VW) Dipl.-Wirtsch.-Ing. Sven Krzoska, expert for Data Mining applications for Industrial Engineering at Volkswagen (VW AG), presents a Prediction Model for Agile Rework Scheduling and illustrates it with an example application from the automotive industry. Already today, large amounts of data are created in production environments to document the construction state and the product quality. However, in most cases, these data are not systematically analyzed and used beyond their original documentation purpose. 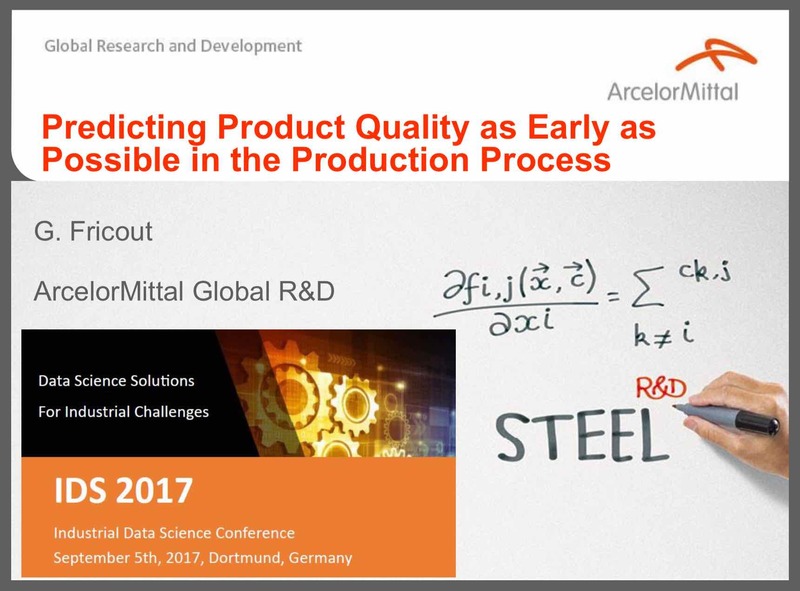 Predicting Product Quality as Early as Possible in the Production Process Speaker: Dr. Gabriel Fricout, Arcelor Mittal Data mining processes have proven to be very valuable for addressing industrial issues such as understanding defect crisis. In classical data mining procedures, only “single value” variables are considered, meaning that one individual, in the steel industry typi- cally one coil, is characterized by average values of many process parameters (composition, temperature, speed, strengths, tractions, composition, etc. Quality Prediction in a Rolling Mill from Sensor Data Streams Speaker: Daniel Lieber, DEW - Deutsche Edelstahlwerke Specialty Steel GmbH & Co. KG Daniel Lieber, deputy operations manager of the rolling mill and forging shop at Deutsche Edelstahlwerke Specialty Steel GmbH & Co. KG in Witten, presents results of the Collaborative Research Center SFB 876 - “Providing Information by Resource- Constrained Data Analysis”, Project B3 “Data Mining on Sensor Data of Automated Processes”.